Ah, yes. The Sports Illustrated MLB Preview came out today. 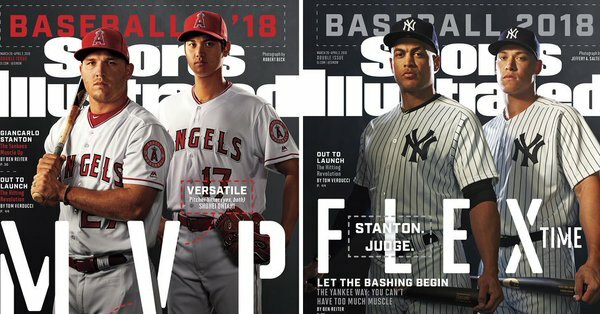 Two different covers, one featuring Mike Trout and Shohei Ohtani. The other offering Aaron Judge and Giancarlo Stanton. The publication picks the Washington Nationals over the New York Yankees for the 2018 world title. I’m starting to feel that myself. Oh, and he hates that home run sculpture. Stanton insists he bears no ill will toward Jeter and has only one wish for his stewardship of the Marlins. It relates to the $2.5 million, seven-story-tall home run installation by pop artist Red Grooms, that sits beyond the left centerfield wall in Marlins Park and which Stanton set into marlin-diving, water-spraying motion 112 times over the past six years, more than twice as often as anyone else. Stanton, in fact, has by himself been responsible for 31% of its activations, which come whenever a Marlin hits a homer. “I can’t stand that sculpture,” he says. “I never liked it. I hope Jeter takes it down. He said he wants to. I hope he does. All it does is suggest that this place is a circus, and we’re the main attraction. There was also a nice read on the Trout-Ohtani partnership. They’re calling the Angels baseball’s most interesting team.